Mercedes-Benz reveals to Gulf Construction that it has sold hundreds of thousands of trucks in the Gulf – which speaks volumes of their appeal. A new test centre ensures the vehicles are in the best shape. Mercedes-Benz’s business operations in the region are managed by Daimler Commercial Vehicles (DCV) Mena, which also has Mitsubishi Fuso vehicles in its portfolio. The brand supplies a wide range of vehicles to the construction, transportation and the oil and gas industries in the Gulf. Its most popular models are the Actros, which represents the heavy-duty truck in the region and has sold more than 100,000 units in a 20-year period; and the Accelo and Atego medium-duty trucks. The Zetros, meanwhile, is especially designed for heavy-duty off-road applications. 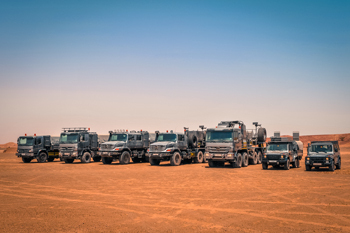 This year saw Mercedes-Benz hand over the 5,555th Zetros truck, besides a major deal signed for 539 trucks in Saudi Arabia. 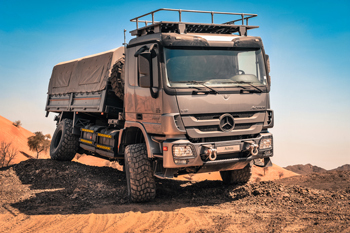 According to a company spokesman, all Mercedes-Benz trucks promoted and sold in the Middle East and North Africa (Mena) region are specially designed for the toughest conditions. They are powered by engines that are able to cope with the climate and humidity in the Gulf and include increased cooling capacity, amongst their many features. Mercedes-Benz offers several air filter options on its trucks since they often operate in very dusty conditions. These options range from the high-performance tandem air cleaner to the cyclone pre-filter. Also, the engines are designed to cope with the array of available fuel quality within the Mena region – from non-regulated to Euro IV emission norm, heterogeneous diesel quality levels, says the spokesman. The Mercedes-Benz fleet in Dubai. Setting standards as the most commonly sold truck in the region with proven experience over decades is the Actros. The truck is especially designed with an adapted chassis layout and powertrain components to cope with the conditions in the region. To highlight the durability of these trucks operating in this region, the company recently ran the ‘Actros Mileage Millionaire’ campaign, which revealed many Actros trucks that have clocked over 1 million km in mileage, and even several trucks with over 2 million km without an engine overhaul. “The campaign was run successfully in the UAE, Kuwait, Saudi Arabia and Oman, with the highest mileage (over 2.3 million km) coming from Saudi Arabia. Tried and tested in the Middle East, the reliability of this truck is amazing,” says the spokesman. Other models such as the Accelo and Atego are robust and agile distribution and cargo vehicles for the urban and medium-radius distribution. The trucks are used in a wide range of applications from cargo to refrigerated bodies, as well as municipal applications. The Zetros continues the success story of the legendary short-bonnet trucks of Mercedes-Benz in the Middle East. The model offers outstanding off-road capabilities (for example, in oilfield operations) and is able to make their way to locations in extreme conditions. The bonnet-type concept offers easy access for maintenance and service, grand easy mounting and operation of all kinds of bodies. Among other milestones, Emirates Motor Company (EMC), the authorised general distributor for Mercedes Benz trucks in Abu Dhabi, inaugurated an engine endurance test centre in the Mussafah Industrial Area in October 2017. The centre is one of only 11 global test centres of Daimler. “The Abu Dhabi test centre is one of the most important locations for the durability test of the proven Mercedes-Benz truck quality as the tests are run in very challenging surrounding conditions, with up to 45 deg C ambient temperatures and up to 100 per cent humidity and in a very tough desert and off-road environment. The results of the test performed in Abu Dhabi will directly impact the engineering work of Mercedes-Benz trucks to ensure that all our trucks keep the brand promise: Trucks you can trust,” states the spokesman. Daimler Commercial Vehicles Mena (DCV Mena) – one of Daimler’s six regional centres in the world – was inaugurated in Dubai in October 2015 as the first of its kind to be closer to partners and customers in the Mena markets and to increase the added value effectively within a short time. DCV Mena runs a full scope of business operations covering sales, customer service and parts, key account management, product management and marketing activities for Mercedes-Benz trucks, vans and buses units, as well as Fuso truck and bus activities in the region. By having all business units located in one complex in Jebel Ali, DCV Mena ensures being close to its business partners and customers in the region and providing customer-tailored solutions, for example, Mercedes-Benz Service Solutions. “To enable our customers to experience a hassle-free service, the company launched Mercedes-Benz Service Solutions, which offer a wide range of service and maintenance opportunities, from the ‘Best Maintenance’ to the full-service ‘Complete’ offer which can be combined with extended warranties ex-works,” says the spokesman. All of these service offers contribute to a longer vehicle lifecycle, and allow customers to benefit from a lower cost of ownership, thanks to an increased vehicle resale value and lower service and repair costs, he says, adding Mercedes-Benz offers the densest “dealer and workshop” network in the Gulf region from Morocco to Pakistan. DCV Mena also hosts the regional logistics centre, which stocks up to 54,000 Mercedes-Benz spare parts that are distributed in the GCC markets including Yemen, Afghanistan and Iraq. The sales, customer services and parts activities for each market are organised via a network of general distributors. The network currently covers 19 markets and is represented by 39 business partners, varying from mid- to large-scale enterprises.